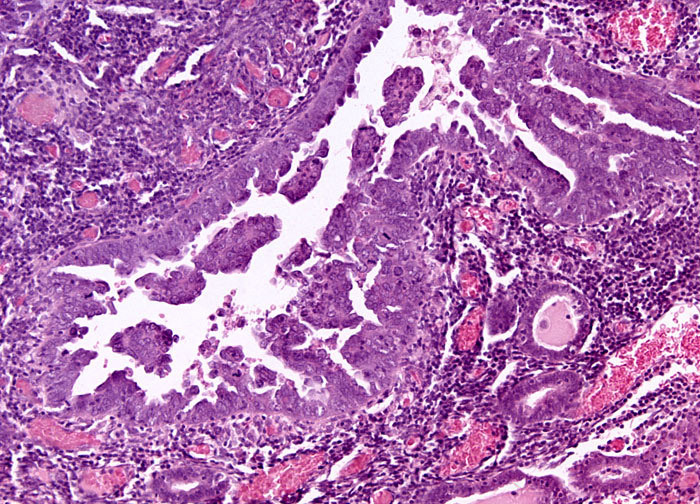 The average age at diagnosis of endometrial cancer is about 60. In addition to age, however, there are a number of other risk factors that increase the likelihood that a woman will develop an adenocarcinoma or other cancer of the endometrium. Being 50 pounds or more overweight, beginning menstruation early or menopause late, never giving birth, various ovarian diseases, and infertility are all associated with an elevated risk of endometrial cancer. Notably, these risk factors all share something in common—they are associated with increased exposure to estrogen. A steroid hormone, estrogen is known to facilitate the growth of endometrial cells, whereas the hormone progesterone impedes it.